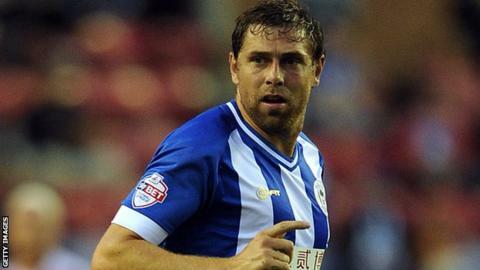 Grant Holt has signed for Aston Villa from Championship side Wigan on a loan deal until the end of the season. The 32-year-old forward joined the Latics in the summer for around £2m from Norwich but only scored twice. His move to the Midlands sees Holt reunite with manager Paul Lambert. The pair won promotion to the Premier League with Norwich in 2011 and Holt was a pivotal figure in the Canaries' impressive first season in the top flight, scoring 15 league goals. The former Nottingham Forest striker scored 21 goals in the Championship in 2010-11 as Lambert's side gained promotion. Villa boss Lambert has succeeded in bolstering his attacking options, after forward Libor Kozak was ruled out for the rest of the season with a broken leg. Alongside current Villa forwards Christian Benteke, Gabriel Agbonlahor and Andreas Weimann, Lambert says he is pleased to have secured the services of an experienced frontman. "When I knew Grant had become available it was something I wanted to pursue quickly because he'll add strength and experience. Having worked with him for three years at Norwich, I know what he can do," said Lambert. "Coming back into the Premier League will rekindle that desire in him to succeed again at this level." Holt - who scored 23 goals in 70 Premier League games for Norwich - is keen to find his best form again under Lambert. "It's a massive opportunity for me personally, an opportunity I couldn't turn down," he said. "To be able to come back into the Premier League, especially at a club as big as Villa, is fantastic."